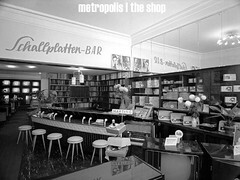 Solos in London, Lille, Slovakia, Liège and Brussels. Interested in telepathic interplay and adapting his sounds with different partners/ groupings. Worked with pianist Guy Strale and percussion poet and graphic artist Kris Vanderstraeten,first as a guitar player(…). Became vocalist gradually since the early 90’s. Gingko 4 -JMVS, Guy Strale, flutist Adelheid Sieuw and guitarist Jan-Huib Nas- performed some years. (Freedom of The City 2006 cd Emanem 4139). Duos: guitarist John Russell, percussionnist Javier Carmona, singer Mara Pigeon, G. Strale, A. Sieuw and guitarist Pascal Marzan. 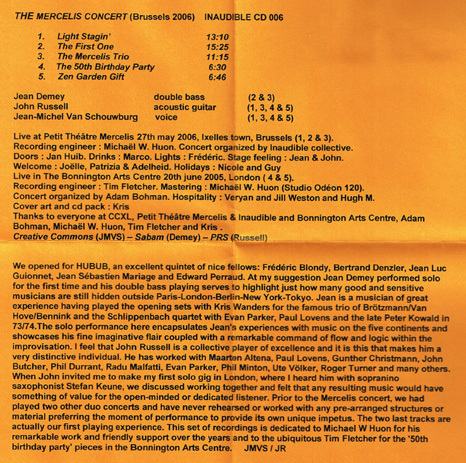 The Mercelis Concert : John Russell/ JM VS/ Jean Demey (dblebass) cd Inaudible 006. SUREAU : Kris Vanderstraeten /Jean Demey/Van Schouwburg (Creative Sources CS112). Garden Gift: Adelheid Sieuw/ John Russell/ Jean Demey/ JMVS Hurta Cordel 08 Madrid Performed with Jacques Foschia, Mike Goyvaerts, Lawrence Casserley, Paul Hubweber, Gianni Mimmo, David Leahy, Phil Minton and Ute Wassermann, Marco Loprieno, Jacques Fauville, Jean Coulon, José Bedeur, Michaël Delia,Timo Van Luyck, Hugh Metcalfe…. Festivals : Freedom of the City London, Sons Libérés Brussels, Hermes Ear Nitra, La Malterie Lille, Bevrijdt de Muziek Antwerpen, Hard Gaan Hasselt, Hurta Cordel 2008 Madrid with Garden Gift, R de Choc 08 Paris. Benjamin Péret’s Poems Performance with Jacques Foschia‘s radios. Workestra of Inaudible.Since 1999, Inaudible has organized continuously workshops & concerts with Belgian and Foreign improvisers in Brussels.Inaudible members : Strale/JM VS/Nas/Sieuw/Loprieno/ Legros/ Demey etc… JMVS writes on the subject of improvised musics and his “Spontaneous Music Ensemble and John Stevens’Story (1965-1994) was published in french magazine Improjazz. I received this nicely packaged CD along with a very kind letter – in Italian! 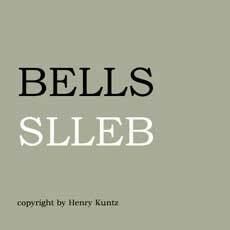 – from Belgian vocalist Van Schouwburg, who told me about the “love and patience” that were put into the realization of this artifact, recorded live at the Petit Théâtre Mercelis in Brussels. There’s no doubt that every minute of this record confirms those handwritten thoughts in full. Jean-Michel is an extraordinary performer, his flexibility and powerful agility crossing the borders between the styles of Demetrio Stratos and Phil Minton, with a little bit of muscle in addition. Comrades in this occasion were guitarist John Russell, really needing no introduction (as announcers used to say when calling Mike Tyson’s arrival in the ring) and double bassist Jean Demey who’s featured in two tracks, one of them a beautiful solo demonstrating an immaculate technique and the will to walk roads leading outside the habitual trickery. While Russell is at his usual semi-acoustic best, this time fusing snappy plucks and chordal bangs with an unheard before rock attitude (listen to the end of “Light stagin'”) and long moments of attentive silence (“The Mercelis trio”), Van Schouwburg is the force to be reckoned as a true revelation here, his constant research for new standards of vocal improvisation – which materializes without sounding wacky or excessively ironic, repeated rants and snarls notwithstanding – scuttling the certainties of what a “singer” is supposed to do during an exhibition. The innocent comments that a young kid in the audience externalizes every once in a while appear as a symbol of purity amidst a radically genuine kind of expression, unpedigreed music that can turn our mood for the better in the space of a few minutes. 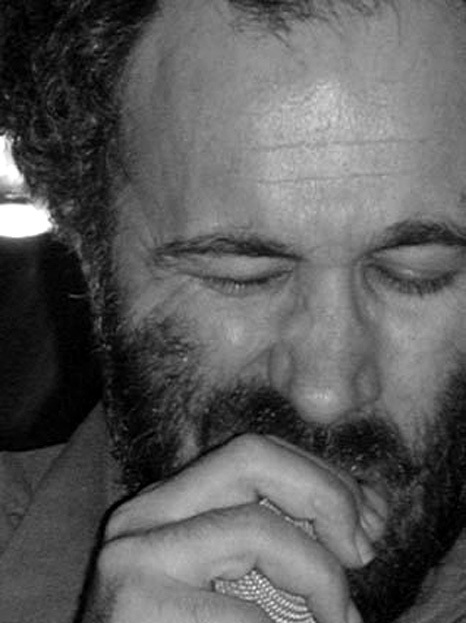 Massimo Ricci. A fixture on the London Free Music scene since the early 1970s, guitarist John Russell has never had the same high profile as some other improvising guitarists, despite his association with the long-running Mopomoso concert series and partnership, with, among others, saxophonist John Butcher and pianist Chris Burn. 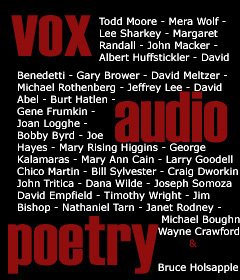 Part of the reason for this can be heard on these two collaborative CDs. Although mostly a series of duos and trio – with one nonet showcase – Russell’s sharp, metallic styling frequently seems to recede into the background. No matter whether he’s matched with an instrumentalist or a sound-singer, and despite how well the guitarist plays, the overall impression is that he’s accompanying the other performer(s). 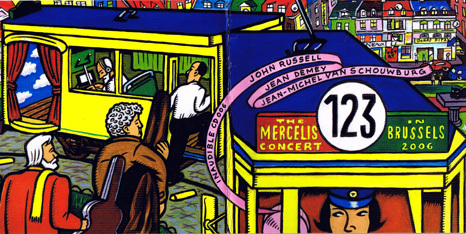 This situation is in clearest focus on The Mercelis Concert, a whimsically-packaged CD that comes with a distinctive, cartoon-like cover and a disc that resembles an old LP. 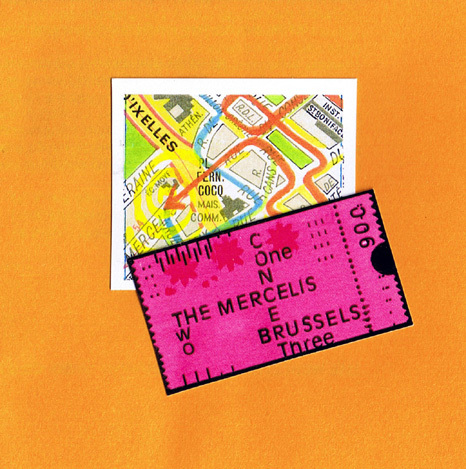 Except for one trio track which adds Belgium bassist Jean Demey – who also and separately has his own impressive solo feature on another track – this mostly Brussels-recorded material finds Russell’s contribution nearly buried beneath the verbal and gullet gymnastics of Waterloo-based vocal improviser Jean-Michael Schouwburg.